The Frosty Frontier Stage is one of the worlds Mario goes to in Mario Pinball Land. As its name implies, it is a frosty land filled with icy floors, snow, Mr. Blizzards, and many ice-skating Shy Guys (Toad's Tent is located at the start of the level). 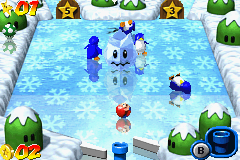 In the middle section of the land with four Penguins, Mario bashes a big Freezie into an icehole, then goes inside to find a cold watery, level with a sunken ship. Inside the ship, he fights Porcupuffer and its brethren. Using Bob-ombs for artillery, Mario defeats Porcupuffer and takes its Star Key to move on. There are also some difficult-to-destroy parka-wearing Monty Moles. ↑ Mario Pinball Land instruction booklet, page 20. This page was last edited on July 5, 2018, at 06:56.